Burger Me! A London Burger Blog: [Review] Pizza Hut Cheeseburger Pizza. With Bacon. 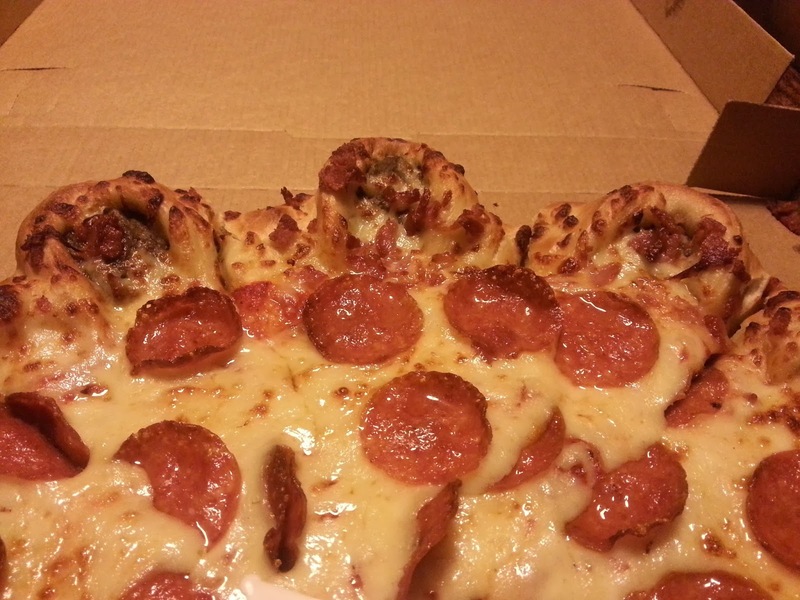 [Review] Pizza Hut Cheeseburger Pizza. With Bacon. Hello. You're going to enjoy this. A lot more than I did. 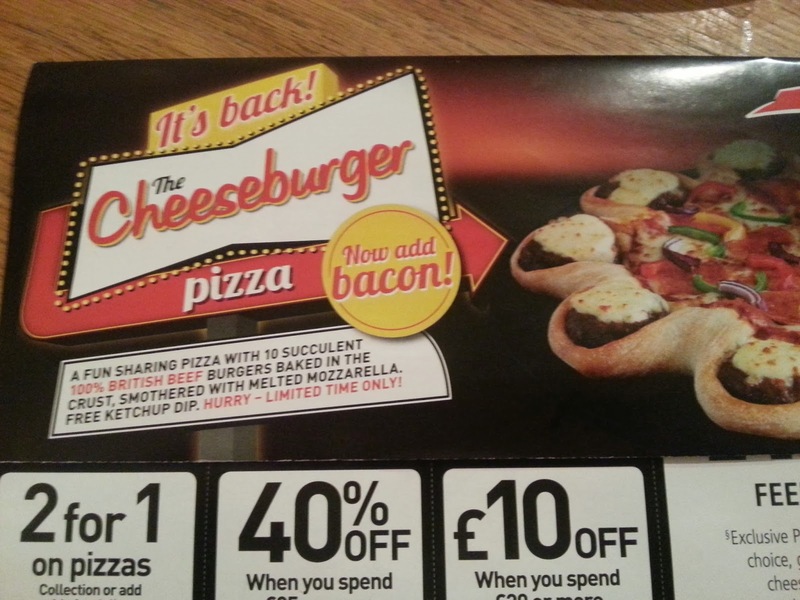 I'd like to introduce you to the Pizza Hut Cheeseburger Pizza. An aberration that could only have been dreamed up on the back of a marathon crystal meth session, and a serious case of American junk food trend following. I have to say, the minute the flyer dropped through the door I wanted one. I was drawn to it like a moth to a flame, as ironically unaware as the moth is, that the result would be doom. I won't lie, even ordering the pizza on the phone was a painful process. It took 7 minutes. To order one pizza. And do you know what, it was the bacon that was the problem. Me: "I'd like a pepperoni pizza, with the cheeseburger crust, and bacon." 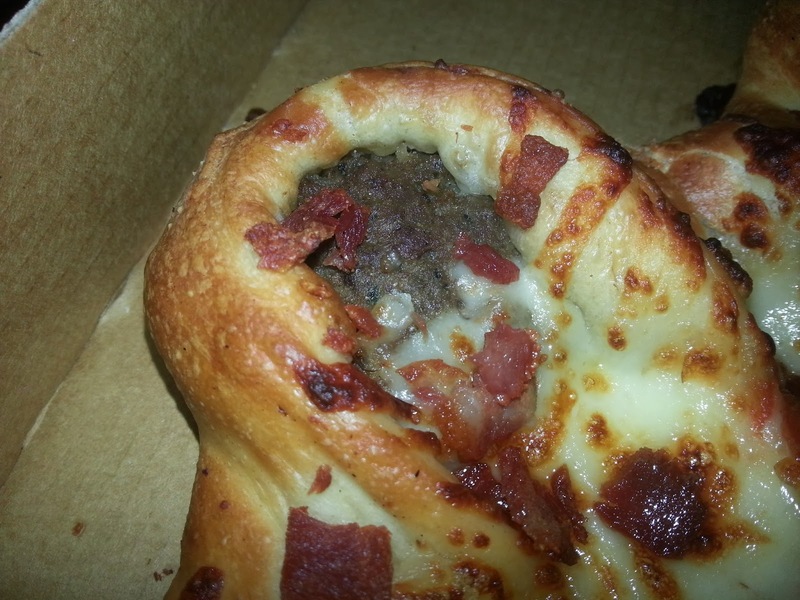 Pizza Hut: "So that's a pepperoni pizza, and a bacon pizza with cheeseburger crust." Me: "No, no, bacon on my cheeseburger crust"
Pizza Hut: "Yes sir, one pepperoni, one bacon with cheeseburgers"
Me: "No, no..." * ad infinitum. That's £18.99. In burger terms that's a night out. It could get you almost FOUR dirty burgers. Or TWO AND A BIT DEAD HIPPIES. But it's delivered to my door, so it's sort of good value, right? Read my lips. Bacon will make it all better. Cheeseburger pizza from Pizza Hut. Exactly as you'd imagine it would be. The cheeseburger crust money shot. like a dough-encircled cesspool. Oh god. Let's just focus in on the rubber pucks of what I'd like to think of as beef here. It takes some really special work to make burgers this bad. I can't decide whether the chopped parsley, the chopped onions, the kebab shop style meat balls, or the spongey, rubbery texture is the worst. or maybe it the spattering of crispy, yet somehow completely plastic tasting bacon. One thing's for sure. I couldn't finish them. 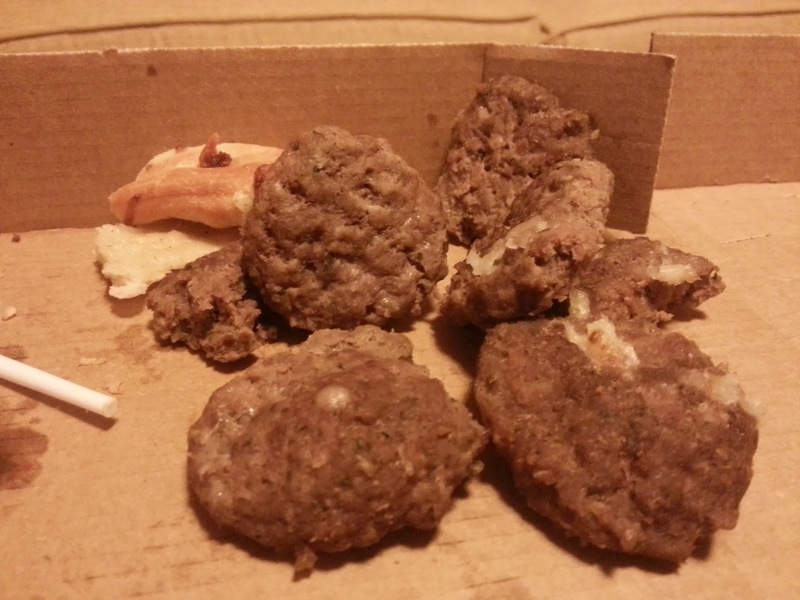 The burgers from Pizza Hut's cheeseburger pizza. Almost unpalatable. I'm not going to go any further. This is an experience that ranks up there with some of the worst burgers I've eaten, including Giraffe Burgers & Cocktails, and the Cheeseburger in a Can. I think this could be the only food in the world that doesn't taste better with bacon. 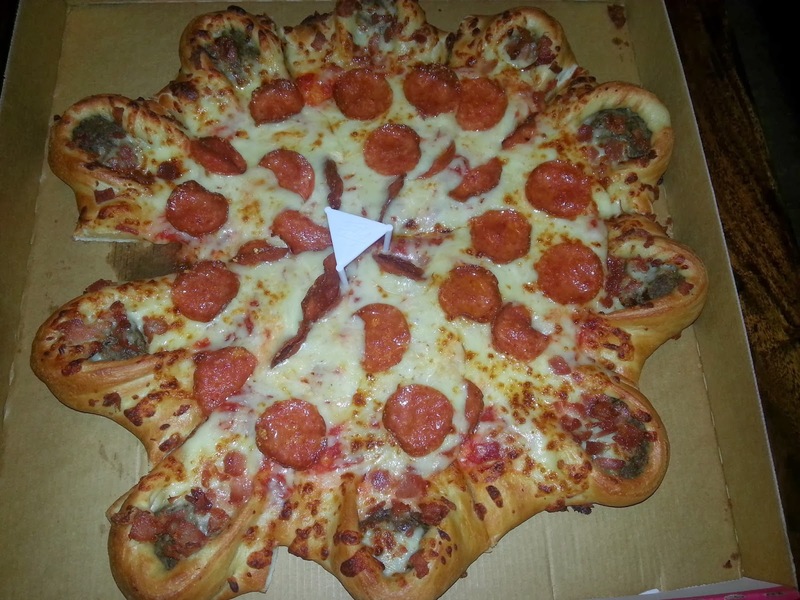 A friend of mine works at Pizza Hut and told me this culinary abomination is the most unpopular product amongst the staff because of its sheer labour intensity: they have to be assembled by hand. She and I discussed how this gastronomic crime against humanity could be made even more disgusting and decided what it needs is the addition of pineapple and sweetcorn and the word Hawaii.